This video shows you how to use rubric codes—a small twist on grading student writing that keeps the feedback but cuts way down on the time. If you’re getting way behind on your grading, this may be just what you need. I’m so glad to hear it! Let me know if you guys end up making any tweaks or learning any tips through trial and error, and whether it makes a difference in time! I tried to emphasize this in the video, but I think the whole-class reflection time after papers are returned is really key. Anyway, update us later, okay? OK…this makes sense. What I usually do is go through the drafts with the personalized detailed feedback. Then when the final draft is done, then I just check of the score using the rubric. Students still want more feedback so I can use the rubric codes for the final draft and they can track it. THANK YOU!!! VERY VERY HELPFUL!! Adding this to my list of things to be thankful for! Thanks! Any suggestions for using this rubric for grading math work? I’m not very familiar with rubrics for math, mostly because I always assume that math teachers grade individual problems, rather than give more holistic assessments. I can see you using codes, however for common math issues. For example, if a student approached a math problem correctly, but just did the arithmetic wrong at some point, you could create some kind of two-letter code that alerts them that there’s a computation error (like CE) that you’d write beside it? 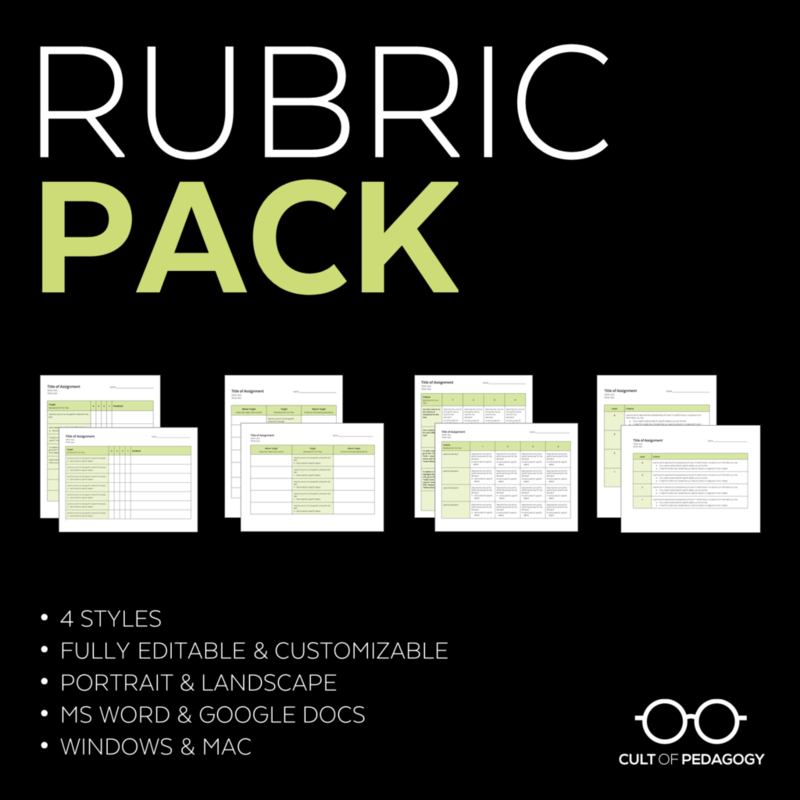 If you’re interested in a rubric that would score homework on a larger scale (rather than calculating individual scores for each assignment), take a look at my free Homework Rubric: I have an Elementary and a Secondary version. Excellent, I need to learn more. I am a teacher in South Africa. I am so, so happy that a colleague sent me your post on rubric codes! Although your post sat in an open tab in my browser for a month (I never got around to it), I’m kicking myself that I didn’t watch your 4-minute video the day that I received it! I’m a secondary ELA teacher who is halfway through grading a stack of capstone research papers, and while I have a system of detailed feedback that I like, I do not have the best time management skills with paper grading. I have always thought that being a good teacher meant giving detailed feedback on everything a student turns in for assessment–and it’s true! Student’s learn best from regular, detailed feedback–but it’s just not realistic. The system above allows me to give the same feedback without writing long, complete sentences. I also like that you put rubric codes where a student did well in green and rubric codes where a student needs work in red. Great, easy idea. I will definitely be trying this with my next rubric. Thank you so much! How would rubric codes work for a single point rubric? Hi Kyle! This is Debbie, a Customer Experience Manager with CoP. Rubric codes can absolutely work with the single-point rubric. I’d check out the post How To Turn Rubric Scores into Grades. There you’ll see how to assign points to a single-point rubric. The same concept can be used to assign rubric codes. For example, in the post you’ll see there are 3 criteria under Structure. You could assign the codes S1, S2, S3, or whatever you think would work best. I’d definitely give it a try! Thanks for all the ideas over the years and for enhancing teaching and learning through your work. As an instructional coach, I can’t even tell you how much your work has helped me help other teachers. Thanks so much for sharing this, Tyler!